This post focuses on two labour market characteristics of immigrants in comparison with non-immigrants: their hourly wage rate and number of hours they spend working in a week. The data used in this publication are based on annualized custom tabulations derived from Labour Force Surveys conducted during 2006-2013. These tabulations were purchased from Statistics Canada. In this section, the hourly wage rate of an average immigrant is compared with an average non-immigrant over the period 2006–2013. Data are analyzed for overall immigrants, immigrant males and immigrant females. Percentage difference of the hourly wage rates earned by an average immigrant and a non-immigrant is computed, annually, within each group for this analysis. A positive difference indicates that an average immigrant earned higher wage rate than did an average non-immigrant. 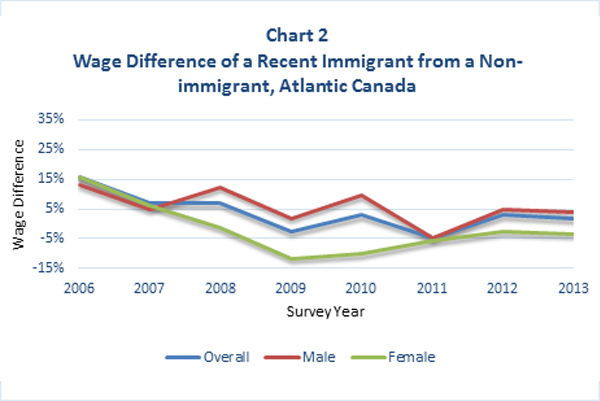 Chart 1 provides a comparison of the wage rate between an immigrant and a non-immigrant resident of Atlantic Canada. Over the entire seven year period, the percentage wage difference was positive for an immigrant in each group (male, female and overall). This means, in each year, an immigrant male earned more than a non-immigrant male, and an immigrant female earned more than a non-immigrant female. Over time, the gap in wages appears to be closing. For example, in 2006, an average immigrant earned 26 percent more than did a non-immigrant while in 2013 this wage gap was reduced by 11 percent (to only about 15 percent). The wage gap has been closing faster for males (going down from 21.8 percent to 12.5 percent for males and from 13.1 to 7.9 percent for females). The gap has been narrower for females than for males in each year. Source: Statistics Canada Labour Force Survey, 2006 – 2013, special tabulations. Note: A positive wage difference means the hourly wage rate earned by an immigrant was higher than a non-immigrant, while a negative difference means the opposite. Wage rate of an immigrant male is compared with a non-immigrant male; wage rate of an immigrant female is compared with a non-immigrant female. Chart 2 provides wage comparisons for recent immigrants, i.e., those who arrived within ten years of the survey. The wage difference has been unstable for recent immigrants over the seven year period. In 2009, and then again in 2011, it became negative when a recent immigrant earned only 2.5 percent and 5.7 percent, respectively, lower than a non-immigrant. In each of the survey years since 2008, a recent female immigrant worker has been earning lower wage rate than a non-immigrant female. In case of recent male immigrants, lower than non-immigrant wage rates are observed in 2009 and 2011. On the whole, there is a declining trend in the wage gap between recent immigrants and non-immigrants. Table 1 provides an age distribution of wage ratios in case of overall and recent immigrants. In the overall immigrant population, an average immigrant earned higher wage in all age groups in 2006 (data for 65 and older are not available for 2006). In 2013, an immigrant in the youngest age group (15-24) earned 4 percent less than a non-immigrant. Wage of an immigrant in the 25-44 age group was the same as that of a nonimmigrant in that age group, but was higher for older immigrants. An immigrant enjoyed lower wage advantage in each age group in 2013 than in 2006. Recent immigrants aged 15 and over earned more than non-immigrants in both years, although their wage advantage over non-immigrants fell to only 2 percent in 2013 compared to 16 percent in 2006. A significant decline in the wage earning of those aged 25-44 is observed, which is made up by older age groups. Table 1: Wage difference of an immigrant from a non-immigrant in 2006 and 2013, Atlantic Canada (%). Note: A positive percentage indicates an immigrant earned more than a non-immigrant. A recent immigrant is the one who arrived in Canada within ten years of the survey year. Table 2 provides gender breakdown of wage rates in each demographic group considered. Males who are older than 44 enjoy wage advantage over non-immigrants in the same age group. The same appears to be true for females, but data on all age groups of females are not available. In this section, the number of hours worked during the survey week by an average immigrant is compared with an average non-immigrant. Data are analyzed for overall immigrants, immigrant males and immigrant females. Ratios are computed of the hours worked by an average immigrant to a non-immigrant, by an average immigrant male to a non-immigrant male, and by an average immigrant female to a non-immigrant female. A higher than one ratio indicates that an average immigrant worked more hours during the survey week than did an average non-immigrant. Chart 3 compares immigrants with non-immigrants. Both male and female immigrant workers worked longer hours during a week than a non-immigrant, in each of the survey years. In 2006, an average immigrant worker worked about 4.5 percent more hours in the reference week than did a non-immigrant in that year. In 2013, the average immigrant worked only 2.7 percent more hours than did a non-immigrant worker. When analyzed by gender, an interesting trend is observed. In 2006, a male immigrant earned about 5.7 percent more hours during the survey week than a non-immigrant male. In 2013, he worked just about the same hours as did a non-immigrant man (the ratio is one in the chart). There was a reverse trend in case of a female worker, however, who worked only one percent more than a non-immigrant female in 2006, while 5 percent more hours in 2013. Note: A positive difference means an immigrant worked more hours than a non-immigrant. A negative difference means the opposite. Work hours of an immigrant male are compared with a non-immigrant male; work hours of an immigrant female are compared with a non-immigrant female. A recent immigrant is the one who arrived in Canada within ten years of a survey year. Chart 4 provides the same comparison for recent immigrants in each of the survey years. Similar patterns of hours worked by a recent immigrant worker, relative to a non-immigrant worker, are found as were found for the groups in total immigrant population as shown in Chart 3 above. Note: A positive difference means an immigrant worked more hours than a non-immigrant. A negative difference means the opposite. Work hours of a recent immigrant male are compared with a non-immigrant male; work hours of a recent immigrant female are compared with a non-immigrant female. A recent immigrant is the one who arrived in Canada within ten years of a survey year. Charts 5 and 6 show the actual hours worked by an immigrant and a non-immigrant in the survey reference week.